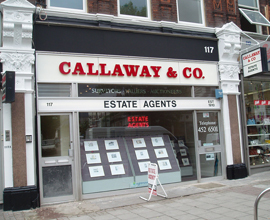 Welcome to Callaway & Co. an independent Estate Agent established in Cricklewood in 1910, committed to combining our experience with personal service and professional values in all property related matters, including commercial agency and property management. For vendor clients we aim to provide a professional service from market appraisal through to the day of your move. Our sales department handles a diverse selection of properties from studio flats to large detached houses throughout postcodes NW2, NW10 and NW6.